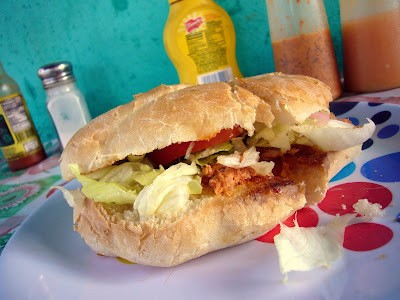 You can find these tasty sandwiches everywhere in Mexico, made with fresh baked, lightly toasted bollos (bread rolls) and filled with your choice of hot eggs, ham, pork, beef, sausage, chicken etc. The fixins include sliced tomato, avocado, onions, lettuce and juicy, spicy pickled chilies. Finally, the bollo is smeared with gobbs of mayonnaise. My description may not sound all that thrilling, but trust me, you haven't lived until you've sampled what I suspect Elvis would have enjoyed daily, had he only made the effort to travel a little further south. The torta pictured above was, by far, the yummiest one I ate during my recent culinary mardi gras (and they were all really good). 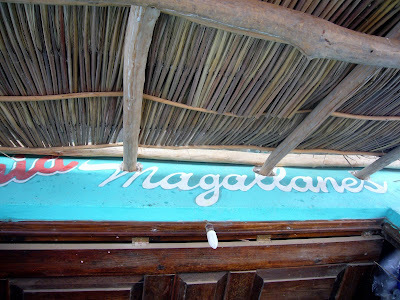 Located in Sayulita (about a 1 hour and 45 minute drive north of Puerto Vallarta), Magallane's is a typical example of a tiny little restaurant serving delicious, fresh food with big taste. 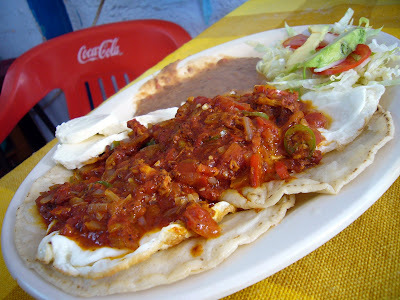 By the way, this torta cost me a whopping 15 pesos (about $1.35 canadian). 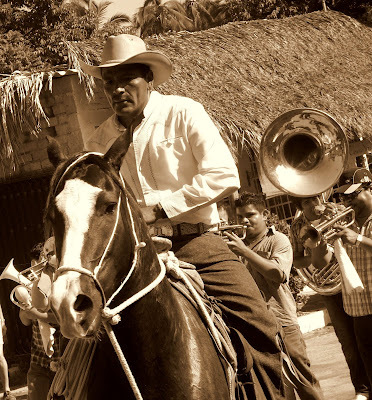 I was fortunate enough to be visiting the small beach town of Sayulita on November 20, the date when Mexico celebrates the anniversary of its Revolucion which first began back in 1910. It is rare that I share an experience here at gp that is not completely food focused, but this day is very important and very special to the Mexican people. And, holy Virgin of Guadalupe....was it ever a fiesta! I wish I had a recording to share with you. The live music that day was incredible, busting out with trombones, tubas, trumpets, clarinets and drums. The entire town showed up to celebrate and to cheer on (or to be a part of) a long parade as it snaked its way through the narrow streets. I was elated to trail at the back of the parade, at one point finding myself sandwiched between the live musicians and men on horseback. Click here to see more photos. I'm back, feeling rested, revitalized, inspired and sun-kissed. 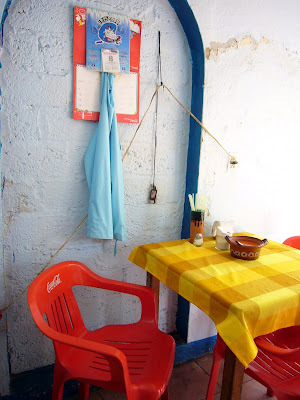 It has been almost 10 years since I've had the great pleasure of visiting Mexico. Though there have been many changes since 1998, it remains as warm, friendly and welcoming as ever. 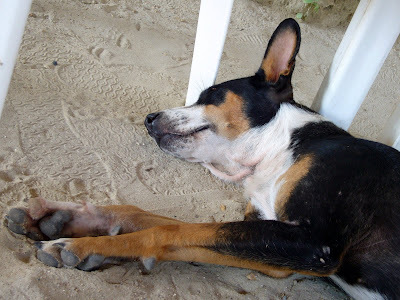 The Mexican people have always been good to me, and their kindness, good humour and playfulness continued to greatly enrich my latest travel adventures. And the food!!!! Oh, my lord, did I eat. When living at home in Vancouver, I am known to be a very healthy and sensible eater. Daily fresh squeezed juice, ground flax, lots of fresh fruit and veggies, complex carbs, blah blah blah. But when in Rome or, in this case, west and central Mexico, I chose to bust out and celebrate my own little culinary mardi gras. Were I to eat this way at home, it would likely do me in. Yet, somehow, by combining the right levels of street food such as beef and pork tacos, greasy tortas (meat sandwiches with chilies and loads of mayonnaise), liquados (fruit milkshakes), hilados (ice cream), chicken stuffed tamales, and cold beer with just the right balance of sun exposure, constant smiles from perfect strangers, ocean swimming, siestas, and walking / perspiring (to the next tastey snack).....I felt great and came home weighing the same as before I left. I would never participate in such indulgent and uncharacteristic behaviour without the help of my trusty amigo, acidophilus. One a day definitely keeps the touristo away. This stuff is golden. 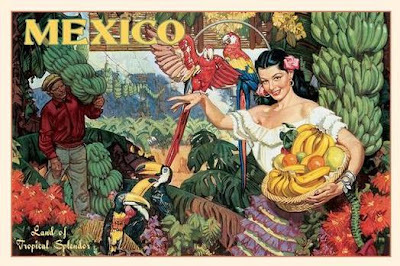 Start taking it 1 or 2 days before the beginning of your trip and continue taking one capsule daily until your return for a healthy tummy and a delicious vacation.....stay tuned for my Mexican culinary experiences. Muy bien. After a hectic couple of months, I am leaving North America behind (for the next few weeks, anyway). Off to Mexico....back November 23. Bueno adiós. Correction! I never knew this, but it turns out that Mexico actually is part of North America. News to me.